The petoskey stone is a very unique type of stone. Formed from natural, fossilized coral, the petoskey stone features complex, hexagonal designs that were once the components of a living creature. Petoskey is only found in certain areas of Michigan and is the official Michigan state stone. Petoskey stone is considered a semi-precious gemstone, but it is actually a type of fossilized coral named Hexagonaria percarinata, a coral that existed millions of years ago. Found only in Michigan, in areas that used to be prehistoric lake beds, the petoskey stone features a mix of opaque and translucent material constructed in hexagonal designs. The stone bears similarity to coral structures that can still be found today. Fossilization is a process by which living tissue is replaced by mineral rock, and the petoskey stone is formed primarily of silica and calcite, but also includes many other minerals. Petoskey stones can be differentiated from other stones because they feature a clear hexagonal construction that is not found in many other materials. Many petoskey stones are found already smoothed by the water and others can easily be smoothed in a rock tumbler. Petoskey stones are so named because they were first discovered near the city of Petoskey in Michigan. The city itself was named after the Indian Chief Pet-o-sega. The petoskey stone has been declared the state stone of Michigan and are still mostly found near the Traverse Bay. Petoskey stones are not usually seen in jewelry, but rather as collector’s items and centerpieces. The stones themselves are not very hard, which is why they are usually polished by the tides around the bay. This means that petoskey stones need special care and should be kept in a safe place. Either on display in a sealed display case or wrapped in a soft cloth if being stored. They are not advisable for use as beads because they wear so easily and need to be treated so gently. Cleaning should be done with a soft, damp cloth and the stones should never be immersed in cleaning solution or put into a sonic cleaner. Due to the fact that petoskey stones are primarily collector’s items, much of the cost of a petoskey stone will be based on its attractiveness and uniqueness as a design piece. Despite their rarity and particular area of origin, petoskey stones are usually not very expensive. The stones are usually purchased by bulk, and several dozen of them can usually be purchased for $50 or less. They are sold through many venues such as online vendors and are relatively easy to find. Larger stones are more valuable, and an extremely large petoskey stone can sell for hundreds of dollars. 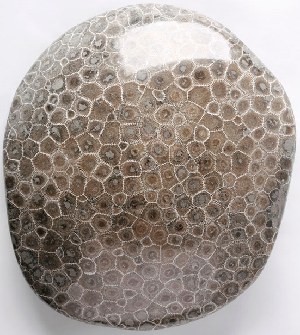 Most petoskey stones will be less than an inch in size, but larger fossilized coral structures have been found. Many petoskey stones are sold unpolished and at a low price but they are rarely displayed without polishing at least one side. Petoskey stones that have more dramatic fossilization with more contrast in the pattern are more valuable. Some petoskey stones may have quite light, almost invisible patterns and will be cheaper. Petoskey stones that are not sold rough are usually sold as free form tumble polished stones rather than as cabochons or specific cuts. Though cabochons can be found, they are extremely rare because the stone does not suit itself to jewelry. Those interested in using petoskey stone for jewelry purposes may want to employ wire-wrapping techniques, rather than setting the stone due to its delicate and fragile composition.